This is such a great recipe for spring and summer that I wanted to share it again. It's in the 70s today -- a gorgeous weekend for Easter. It's definitely a pesto pasta salad kind of day! Pesto is Big, Bold, and Beautiful and fits perfectly with the spirit of this blog. It's fresh, fragrant, colorful and bursting with the flavors of basil, garlic, freshly grated Parmigiano Reggiano cheese, toasted pine nuts, and extra virgin olive oil. Pesto can discolor and get muddy-looking, so my secret to fixing the bright, green color is to blanche the basil. Works every time. I like to serve pesto on rotini pasta with grape tomatoes, and if it's a meal, with diced chicken, cubes of fresh mozzarella, and whole toasted pine nuts. This can be served hot, cold, or at room temperature, and it's great for parties. Cook rotini according to the directions on its package, in salted, boiling water until al dente. Drain pasta (do not rinse), put in a bowl and mix with pesto sauce. Taste and adjust seasonings as necessary. Add grape tomatoes, pine nuts, and grated cheese to your liking. Rinse basil thoroughly to rid it of any dirt. I use my salad spinner to do this and/or I soak the basil in a large bowl of water so the dirt will fall to the bottom of the bowl. Bring a pot of water to boil. Add the basil and blanche, cooking for a minute or so, or until the color turns a little darker. Cool immediately in an ice water bath or under cold running water. Use the salad spinner to dry the blanched basil and or wrap in a dishtowel remove any excess water. Blend the basil and the rest of the ingredients except for the oil in a mini-food processor or blender. Slowly drizzle in the oil until a paste forms. TO TOAST PINE NUTS: Heat a small skillet over medium heat. Add pine nuts and cook, stirring, until you can start smelling the nuts and they get a little brown. Keep an eye on the nuts and stir as they can burn. It looks fresh and delish. I like the pesto with the cherry tomatoes. Pesto is one of those things that may not look attractive but when combined with pasta, chicken or pork, becomes one of the most amazing combinations known to man! 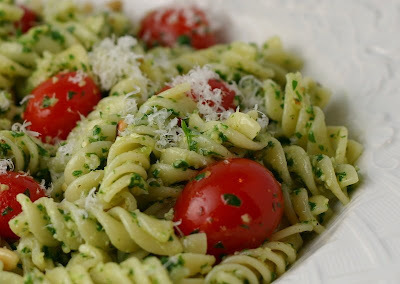 I loe pesto pasta and yours looks great!